The Hulk is a fictional superhero that appears in comic books published by Marvel Comics. The character was created by Stan Lee and Jack Kirby, and first appeared in The Incredible Hulk #1 (May 1962). Throughout his comic book appearances, the Hulk is portrayed as a large green humanoid that possesses limitless superhuman strength and great invulnerability, attributes that grow more potent the angrier he becomes. 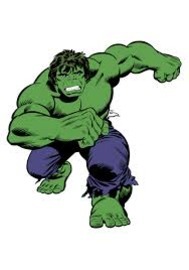 Hulk is the alter ego of Bruce Banner, a socially withdrawn and emotionally reserved physicist who physically transforms into the Hulk under emotional stress and other specific circumstances at will or against it; these involuntary transformations lead to many complications in Banner's life. When transformed, the Hulk often acts as a disassociated personality separate from Banner. Over the decades of Hulk stories, the Hulk has been represented with several personalities based on Hulk and Banner's fractured psyche, ranging from mindless savage to brilliant warrior, and Banner has taken control of the Hulk's form on occasion. Banner first transforms into the Hulk after being caught in the blast of the gamma bomb he invented while saving Rick Jones, a youth who had wandered onto the testing range. The character has been portrayed in multiple media features by different actors. Hulk was first portrayed in film played by Eric Bana in Ang Lee's Hulk (2003). Subsequently, the character has been portrayed in the Marvel Cinematic Universe initially by Edward Norton in The Incredible Hulk (2008) and by Mark Ruffalo in The Avengers (2012) and Avengers: Age of Ultron (2015), as well as both parts of Avengers: Infinity War (2018/2019). In 2011, the Hulk placed No. 9 on IGN's list of Top 100 Comic Book Heroes.